We were in Bali with the family in June 2018. My fiancé Veiko was working and having meetings, and I spend time with the children and working on and off as well. It is our 4th and last day here and we decided to explore Ubud with the family. 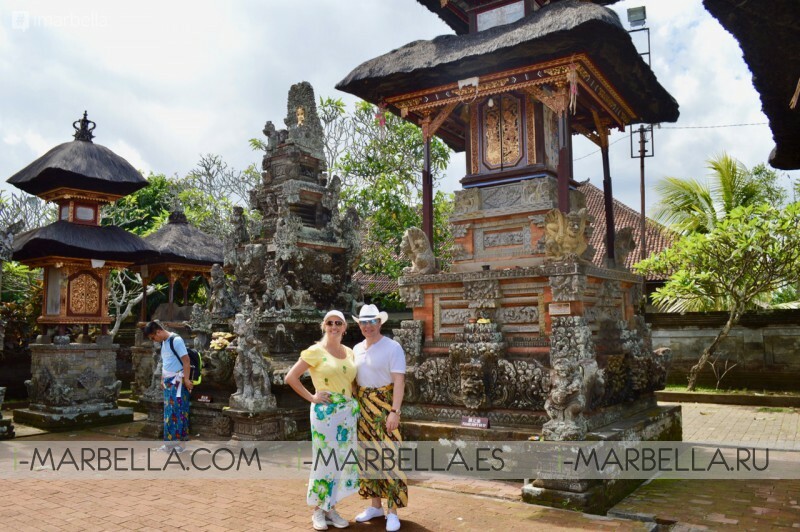 We were living in Seminyak and travelled to Ubud which is 1.5 hours from there. There were picturesque rice fields by the road. Exactly like in the pictures. At first, we visited the Luwak Coffee Trail, tasting different coffees and teas. There was also a large swing on the mountainside with a view to the greenery and the valley. The Kopi Luwak coffee is made by feeding coffee beans to the Asian palm civet, collecting the pooped out beans and roasting them on a hot pan for an hour, after which the beans are dust. It is the most expensive coffee in the world. We tasted 13 different teas and coffees and after that, we ordered and drink a cup of Kopi Luwak coffee. It was delicious. Then, and I think this was the most emotional ride in Ubud, we took turns swinging on the big swing and tested our nerves. We got good pictures and a good beginning for that day. Next, we visited a temple in Ubud. There are temples everywhere there, and I mean everywhere. Nearly every building in the street and every house looks and feels like a temple. The temple we visited was special due to a water pond by the big and large, main door. The pond had fish, turtles, and frogs; it was peaceful and really natural. Next, we went to have a meal at a rice field near Ubud. It felt like all the tourists had gathered there. Nevertheless, the food was good and the view of the rice field was wonderful. This place also had a water body with fish and seats to view over it. It was an experience of its own. 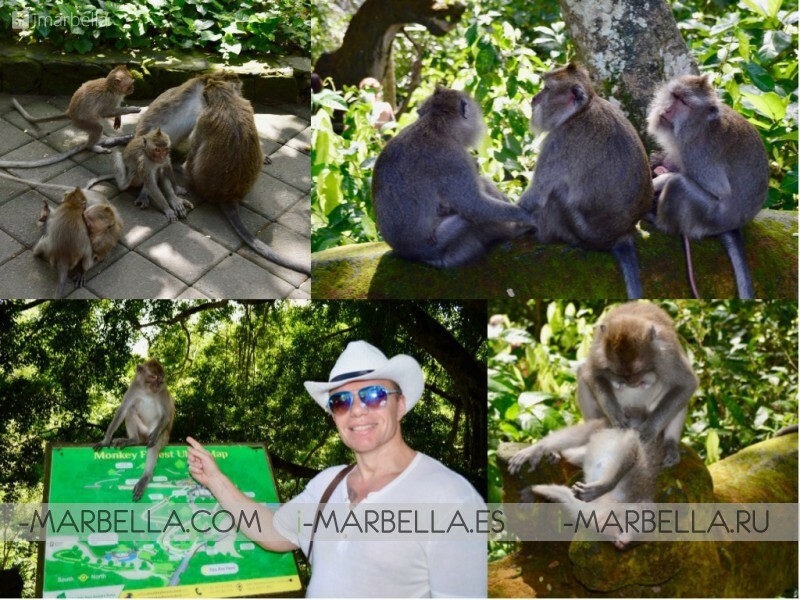 We continue with a visit to the monkeys. Yes, is just as it sounds, there were a lot of monkeys of every size, individually and in groups. The place itself was a huge and impressive rainforest, which had some sort of temple gardens. We were very impressed by a pass reminiscent of the Grand Canyon, which had water in its bottom and a high bridge over it with a very large tree. We took hundreds of pictures there :) This trip to the forest seems like a real trip to the rainforest and the stairs and paths were like in a natural forest as well – a little wet and slippery. Next, we visited a butterfly park. We learned about the life cycle and transformation of butterflies. The farm was located in the middle of the rice fields. The farm itself was like a garden covered with a net. It was beautiful, all these flying butterflies were so pretty and there were so many of them. It's a pity that they live for such a short time and die where they are born. Smaller butterflies live up to 3 weeks, they have no mouths and they can eat only through the body and legs. 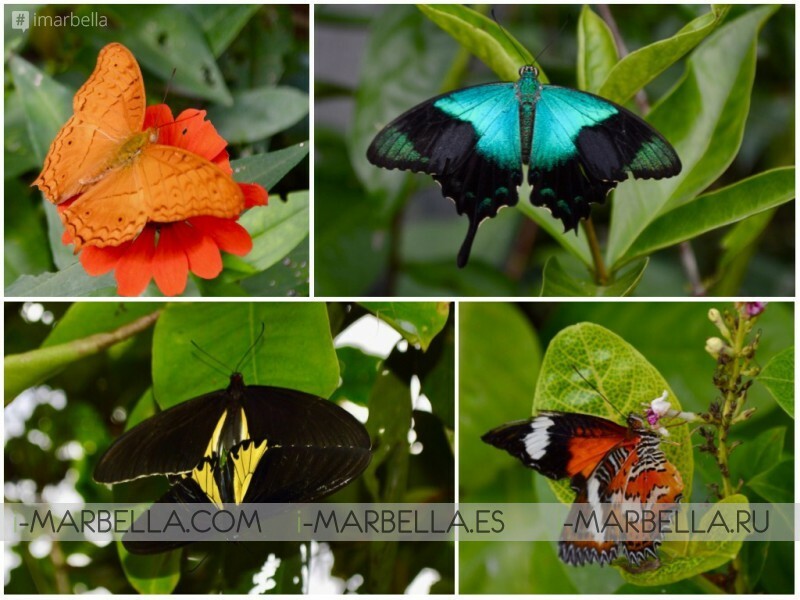 In the last corner of the garden, we were able to take pictures with large butterflies who only live for 5 days. Such a pity. They just die since they have no mouth and they cannot eat. And, to make it worse, their birth takes several months. Our last stop was a waterfall in Ubud. It was impressive, we walked down the stairs to the waterfall and there were many places to take pictures. Coming back up was quite a challenge though – the stairs were high for each step, and you had to go slowly; but of course, we managed. At the top, we sat in a cafe on the cliff and enjoyed some fresh and cool coconut water. The ride home was long and tumultuous, with traffic jams that took quick a lot of time. And that’s not all. We didn’t manage to visit even half of the places we thought about, like the Art market, the cooking course.